NEW HOLLAND – Yeah, it would’ve been nice to win it. Yeah, it was a tough pill to swallow. 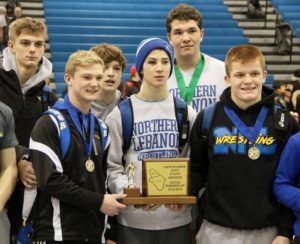 But at this point, the Northern Lebanon wrestling program has seen it all. And the strength of the Vikings is founded in their ability to take everything in stride. 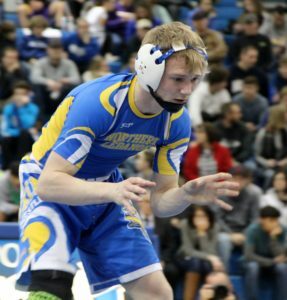 On Saturday afternoon at Garden Spot High School, Northern Lebanon finished as the runner-up by the slimmest of margins in the team competition at the annual Lancaster-Lebanon League Wrestling Championships. 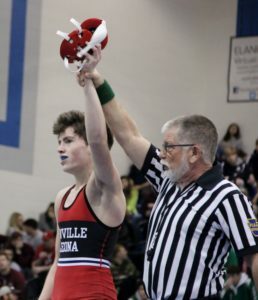 The team title came down to the final match of the two-day tournament, and the Vikings were relegated to second when Manheim Central’s Tyler Dougherty pinned Zach Shelley of Lampeter-Strasburg in the championship bout at heavyweight. Dougherty’s fall gave the Barons the overall team championship, by a point over Northern Lebanon, 184.5 to 183.5. 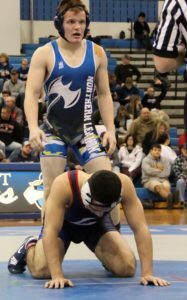 Four finals bouts earlier, Viking senior Ethan Herb had vaulted Northern Lebanon into first place in the team standings with an 11-1 triumph over Lebanon’s Dallin Ocasio in the 170-pound weight class championship. 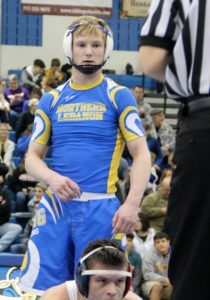 Herb’s was the second individual title of the tournament for Northern Lebanon, after fellow senior Colin Leonard had scored an 8-4 victory over Seth Hoopes of Octorara in the championship match at 126 pounds. 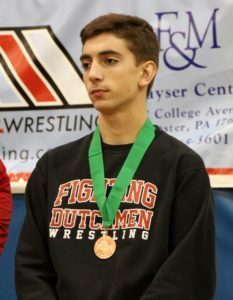 The only other Lebanon County competitor to strike L-L League gold was Annville-Cleona’s Matt Inman at 113, where he nudged Jackson Houghton of Solanco 6-3 in the finals. Viking Brandon Breidegan reached the final bout at 120 pounds, but was steamrolled by Manheim Central juggernaut Will Betancourt in 1:04. For the Vikings, it was their second runner-up finish to Manheim Central in as many years. 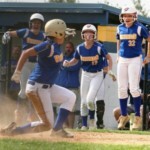 Northern Lebanon, which earlier in the season captured its seventh straight L-L Section Three crown, has now finished either first or second in the last seven league tournaments. 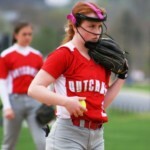 “You just swallow it,” said Northern Lebanon head coach Rusty Wallace. “You can’t focus on the negatives. We had some matches get away from us, matches we could’ve won. But we had some matches that we were probably fortunate to win. Needing to win against Ocasio and needing to score extra points for the team, Herb opened a 2-0 lead in the final at 170 pounds with a late first-period take-down. Then early in the second period, Herb padded his lead to 4-0 with another take-down. “I didn’t know anything about him,” said Herb of Ocasio. “You’ve just got to wrestle who’s there. You’ve got to wrestle tough. I felt pretty comfortable. I’ve just got to stay tough and keep my hips back. Herb led 8-1 after the second period, then added three more points in the third to cinch the major decision. 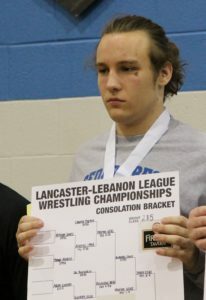 For Herb, it was his initial Lancaster-Lebanon League weight class championship. “It’s nice to finally win,” said Herb. “Last year I got second, and the year before I was sixth. It’ll help later in the year. I think this shows where we stand with our league. Leonard appeared calm, cool and collected in cruising to his championship at 126 pounds. Versus Hoopes in the final, Leonard notched three take-downs and a second-period reversal. He led 4-2 after the first period and 8-3 heading into the third. “I wanted to go for outside shots. I didn’t want to go inside,” said Leonard. “I didn’t want to go upper body with him. I didn’t want to get thrown. It was, ‘Go out there, get the win and walk off the mat a champion.’ That was, overall, a better match for me. 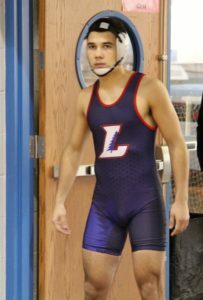 Now 26-5 this season, Leonard’s league championship was his second straight, to go along with an L-L silver, and a fourth-place showing as a freshman. 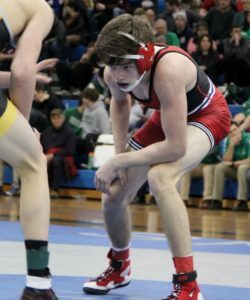 After finishing eighth in the state in his weight class last season, Leonard’s goals moving forward are fairly clear-cut. “There were a couple of matches I shouldn’t have lost,” said Leonard. “Then I picked up the pace and started well. Other than that, it’s (the season) been going well. I’ve been getting majors, techs and pins. Getting off to a solid start was also the key to Inman’s title at 113 pounds. He scored a pair of opening-period take-downs to open a 4-2 lead on Houghton. Then with 16 seconds remaining in the middle stanza, Inman took Houghton down again to extend his lead to 6-3. “My coaches told me he was going to be physical and aggressive,” said Inman of Houghton. “I had to match that intensity. I wrestled smart. I took some low shots. I was feeling good on my feet. Inman had reached the championship bout at 113 with a 6-4 semifinal victory over Mason Casey of Garden Spot earlier in the day. 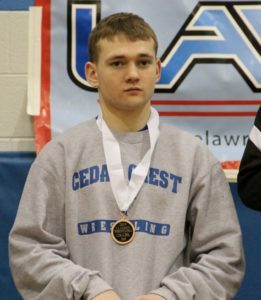 He also topped Austin Brass of Ephrata 13-7 and pinned Skyler Nagel of Elizabethtown. 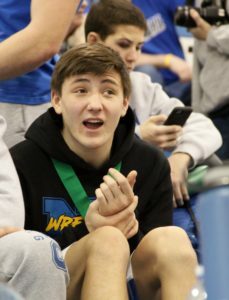 “To me, the league tournament symbolizes the beginning of the postseason, the hard, gritty matches,” said Inman, who was seventh in his weight class at last year’s L-L Championships. “There’s a lot of good kids here who will put together good, deep runs into the postseason. 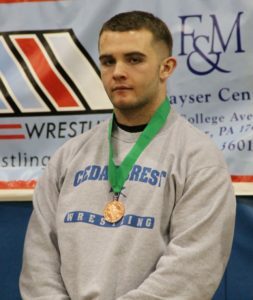 Other strong showings put forth by Lebanon County competitors at the Lancaster-Lebanon League Championships included: Cedar Crest’s Nick Stout, who came in third at 285 pounds; Viking Nick Goodyear, who was fourth in that same 285-pound weight class; Cedar Crest’s T.J. Moore, who was fourth at 220; Annville-Cleona’s Hayden Funck, who finished fourth at 138; Cedar Crest’s Taylor Gehman, who took third at 126. 106: Dominic Flatt, Solanco md Micah Sams, Manheim Twp. 8-1. 113: Matt Inman, AC d Jackson Houghton, Solanco 6-3. 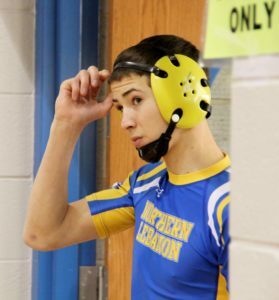 120: Will Betancourt, Manheim Central p Brandon Breidegan, Northern Lebanon 1:03. 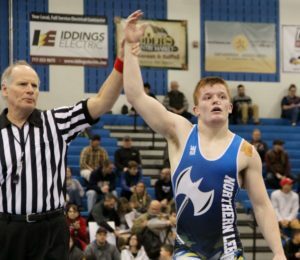 126: Colin Leonard, Northern Lebanon d Seth Hoopes, Octorara 8-4. 132: Cade Zeamer, Manheim Central d Braeden Amole, Octorara 8-2. 138: Kayde Althouse, Ephrata d Austin Rider, Conestoga Valley 2-1. 145: Gabe Miller, Pequea Valley p Bradley Cunningham, Lampeter-Strasburg 3:23. 152: Colt Barley, Penn Manor fft David Over, Manheim Twp. 160: Josh MacNamara, Conestoga Valley d Garrett Blake, Donegal 6-0. 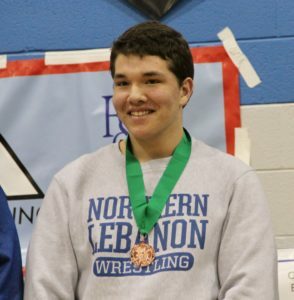 170: Ethan Herb, Northern Lebanon md Dallin Ocasio, Lebanon 11-1. 182: Keegan McCord, Manheim Central d Nicholas Baker, Penn Manor 3-2. 195: Roland McClune, Warwick d Johnny Franklin, Lampeter-Strasburg 5-3. 220: Dustin Swanson, Garden Spot d Tyler Phenegar, Lampeter-Strasburg 4-2. 285: Tyler Dougherty, Manheim Central p Zachary Shelley, Lampeter-Strasburg 2:49.